There are few things more enjoyable at night in camp than staring at the fire and the night sky. Now you can be an astrological expert and dazzle your camp mates with your night sky knowledge. There’s lots going in this April, including a meteor shower, a lunar eclipse and a solar eclipse! So grab your telescope and your tent and get out there! April 15 – Total Lunar Eclipse. 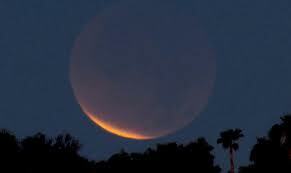 A total lunar eclipse occurs when the Moon passes completely through the Earth’s dark shadow, or umbra. During this type of eclipse, the Moon will gradually get darker and then take on a rusty or blood red color. The eclipse will be visible throughout most of North America, South America, and Australia. April 29 – Annular Solar Eclipse. An annular solar eclipse occurs when the Moon is too far away from the Earth to completely cover the Sun. This results in a ring of light around the darkened Moon. The Sun’s corona is not visible during an annular eclipse. The path of the eclipse will begin off the coast of South Africa and move across Antarctica and into the east coast of Australia. Arizona desert weather is perfect for camping during this time of year, with clear cool nights, and the desert looking as green as it will all year, following the winter rains. A bit too early for the desert wildflowers, but the cactus were beginning to bloom, and the Ocotillo’s bright red flowers were just beginning to show. There really is something mystical about the desert, so vast and vacant, untouched by modern civilization. So rich with history, this prehistoric land of the ancients. There is something about standing on the same land as the Anasazi, the Hohokam, and later the Hopi, Apache and Mojave Indians, and realizing that very little has changed since their time. Now I love camping just about anywhere, and grew up camping in the lush, verdant forests of the upper mid-west, an area equally as rich with its own unique brand of history. And I’ve spent a great deal of time camping throughout the southeastern United States, almost always near a river or a lake. Something I don’t get to do very much now that I camp primarily in the more arid southwestern area of our country. I do try to camp all around the country as often as possible however. I want to know how our tents perform on humid Florida nights, or how they keep out the mosquitoes on a hot Minnesota summer day. I want to know that our tent will keep me dry even during the worst northwest soaking rain storms, and to see how our fabrics hold up in the blistering sun and heat of the southwest. This particular trip however, there would be none of that. Perfect weather, and as we like to say here at PahaQue, any tent performs well in fair weather. On this trip we were comfortably camped on Perry Mesa, in our Perry Mesa tent! There were three of us – our VP Mike, our CFO Craig, and myself. We camped about 2 miles from Squaw Creek Ruins, a massive pueblo complex overlooking Squaw Creek Canyon, and Squaw Creek about 1000 feet below. It is fun to hike the last few miles to this site because you really get a good feel for the lay of the land as you approach the ruin and the southern edge of the mesa. This area represents a massive prehistoric civilization site, comprising over 20 pueblos on approximately 20 square miles. And it is remote and relatively untouched. The sense of history is heavy as you tread over trails, see trash dumps filled with pot sherds, collapsed pueblos that are over 800 years old. This was one of the last ancient civilizations prior to Spanish contact. So for this particular trip, the only testing that occurred was on our legs. This is rugged country, and two miles here can seem like ten. Constantly trying to avoid ankle-breaking rocks, painful cactus, and other such obstacles can make for a tricky hike. Trying to keep your eyes on all the amazing sites around you, while watching each step to avoid falling on your face is the real trick. So after hiking/stumbling the 4 miles to and from the ruins, and the additional odd mile or two spent exploring the area, seeing our Perry Mesa’s on Perry Mesa was a welcome site indeed! No matter where you camp, your tent is your home away from home, and is always a welcome site after a long day of physical activity. And fortunately for us there was no severe weather testing of the tents this trip. However, we did find three scorpions under our tent upon packing up on our last day. So I guess we can call that our bug-test trip. And it seems even those nasty little dudes know where to go to find good shelter! Good thing we kept our tent doors zippered tight! If you’ve had fun or exciting camping experiences with your PahaQue Tent or Shelter, please take a moment to share it with us. We love to hear your stories! Also be sure to check out the details on our upcoming photo contest – you might just win a free PahaQue Shadow Mountain Cabana! See you ’round the campfire! Questions/comments/requests/suggestions/lymricks/thoughts on life/childhood stories? Feel free to drop me a line at jasonr@pahaque.com. • First, make sure everything is off. Camp stove, flashlights, headlamps, GPS—anything you have with a shut-off switch should be shut off. You should also remove the fuel from your stove and batteries from electronics if your gear is going into long-term storage. • Dry all your stuff completely, and if it doesn’t already have a protective case, store in a sealed plastic bag. Your camp stove won’t turn into a Gremlin if it gets wet, but the likelihood of corrosion or rust will be reduced if you can store it as dry as possible. • Clean your camp stove and utensils thoroughly with warm water and soap. Make sure to get all food residue off the inside and outside of the stove, or you could have an ant party on your hands. • Store your cooking stove fuel in a cool, dry location where it won’t be tormented by extreme heat or cold. • Store a self-inflating sleeping pad loose, not rolled up. This will keep it well-aired and springy. • Give your hiking pack a thorough cleaning when you have some downtime between outings. Use a vacuum on the inside of your pack, and then wipe down the outside with a damp cloth and mild soap or chemical-free detergent. Hose it off with cold water until no soap remains, and hang-dry your pack upside down in a shady or well-ventilated spot out of the sun. • Don’t use a washing machine on your pack unless you’re faced with a global mildew crisis and have no other options. If you absolutely insist on using modern technology, wash on delicate in cold water with a chemical-free detergent. Don’t use a dryer—hang upside down to dry for a few days with a fan nearby. Well maintained and properly stored gear will ensure years of reliable service. From tents to hiking boots, taking the time now will make sure future trips are not plagued by gear problems.